These 27 strand nylon cinches are made with a leather, or suede diamond shaped center. Sorry we have no control over the color or leather type of the diamond. Please call 513-724-0778 if you want some color in particular. We will let you know if we have it or what colors are available. They are hand braided for strength and durability these roper style cinches are super for the working saddle draft! The initial measurement will be up to 7" smaller, because these cinches stretch once they are on the horse. Order the correct size please and we will send you the one you need. Sizes: Available - 38", 42", 44", 46", 48" and 50". They come in assorted color leather or suede centers. 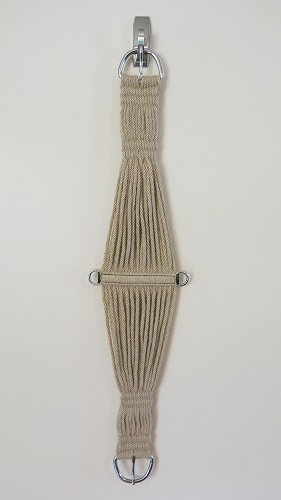 The 27 strand natural color 100% mohair cinch stretch once they are on the horse. Order the correct size please and we will send you the one you need. It will measure shorter until it is tightened. Lenghts: 36", 38", 40" & 42"
This is a 25 nylon strand double woven Roper Cinch with 3 1/2" nickel plated straight pull buckles, and nickel plated D's at the ends of a brown nylon wrapped center. It will measure shorter when not on the horse because these will stretch when you tighten your saddle. Order the size you need when on the horse. Lenghts - 42", 44", 46"
Neoprene Draft Horse Roper and Cutter Style Cinch. Features billet keepers for all size billets. Available in sizes 38" thru 46". Our custom made western cinches can be ordered in any color nylon listed below with your choice of black felt or your choice of solid colored or print fleece. Please note: Felt is available in black only. To see most of the options click on "Click to see Fleece and Quilt Options" above on the left side. Sizes: 38", 40", 42", 44", 46", 48"
Other sizes can be ordered with a note in the box on the Cart Contents page. Since these girths are custom made estimated delivery time is 2-4 weeks. You can use the cinch and the Tacky-Tack Saddle Pad for a very secure saddle, or use it by itself, to help stop the need to overtighten the cinch to keep the saddle from slipping. 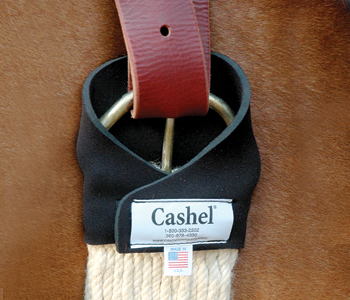 Size: 38", 40", 42", 44", 46" and 48"
Made to keep your cinch ring from pinching or chafing your horse. A hook and loop closure makes these easy to put on, and ensures your horse's comfort under saddle. The black closed cell foam does not absorb sweat and will easily rinse clean after use. This English converter converts an English Girth to a Western Cinch. It has two English billet buckles (large enough for Australian billets) attached to a Western D-Ring on a leather backing. Your saddle billet straps buckle to the English Converter on each side of the saddle, providing a D-Ring for attaching the off-billet strap and latigo (not included). This lets you enjoy a lighter weight English saddle while keeping the leverage and security provided by the western cinch/latigo system. Your saddle billet straps buckle to the English Converter on each side of the saddle, providing an easy way to secure your western cinch. Sold as a pair. Hand made in the USA in the state of Mississippi. 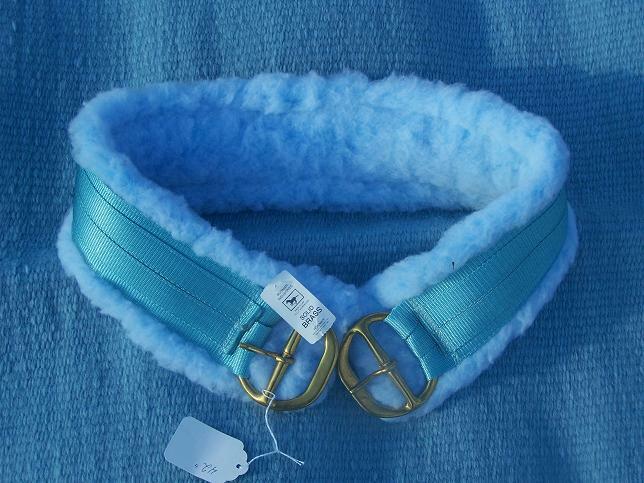 This 2 inch wide rear cinch is top quality and made for draft horses. Adjustable from 50 inches to 87 inches. Custom made from 100% Harness Leather for strength and durablilty. Leather Colors: Lite oil, Brown, Dark Brown and Black.